New Thundercat in the works! As you can see I have a frame, swing arm, front calipers (need rebuilding), rear caliper (needs rebuilding) and clutch cable. The R6 5EB shock would require some major modification to fit the T'cat so that will be getting sold with the linkage to fund a replacement. Re: New Thundercat in the works! Good start for a good price. Take the opportunity to upgrade rear shock to r6 and think about gearing also. I got the Frame, Swingarm, suspension linkage, number plate and a full HPI check (it's clean) for £30. I only have to apply for a new log book. Looks like fun, are you gonna build it standard or are you planning something unique? @dudeofrude wrote: Looks like fun, are you gonna build it standard or are you planning something unique? Do you need the black plastic tray that hold the battery and everything under the seat? At the moment yes but I will put a list up tomorrow in a new thread once I've sorted myself out. Updated the main post etc etc. Its like one of those 'Build a sailing ship' magazines, when you get a part a week! I read that as D'Agnostic Thundercat. Aye - build your cat over 1000 weeks. £15 per issue. You're onto a winner! That occurred to me as well, not very cost effective. Ondurin's Frankenwagen is possibly more appropriate. Yes I know not cost effective at all. Doesn't bother me though, getting another T'cat is a good thing and building it from this method is going to be good for my confidence in building a bike etc. @Ondurin wrote: Yes I know not cost effective at all. Doesn't bother me though, getting another T'cat is a good thing and building it from this method is going to be good for my confidence in building a bike etc. The magazine thing is not cost effective (the magazine instalments are about twice the price of buying it in one go). Cost doesn't come into what you're doing. Picking up a running engine on Sunday with a ton of spares. Will get pics once I'm home with it all. So after a rather long 3 hour 30 minute drive I finally got to Hull for the Tcat parts, there was more than expected, filled up the entire back of my Mazda 3! So I then drove 3 hours 30 minutes back to Oxford and unloaded the car, this is the results! Other than that I'm happy with the £350 that lot cost me. It looks like what you would find in the gravel trap after a highside & barrell roll on a track day lol. 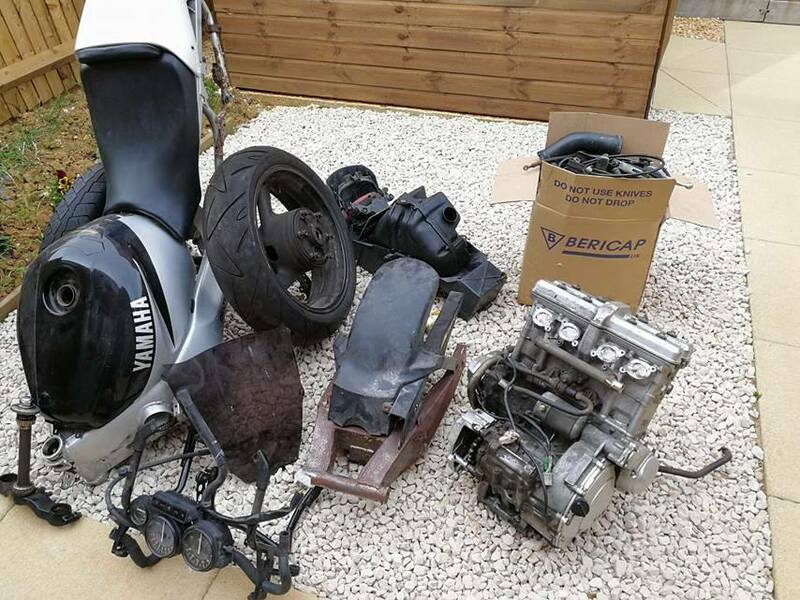 Plenty of parts now to make a good start raymond. Looking over the parts that I need will be the following: Front Forks, Radiator, Fairings, full exhaust system and chain & rear sprocket and maybe a few other parts but until I can get time with the bike it's just a rough list. Had some spare time this morning so I started to pre-assemble the clip-ons. Next week will see the bigger updates as I have 5 days off (Yes I booked some Holiday just to do this! ) to tinker and drill out the old header studs and replace them with new ones. I'm having an issue finding a set of front forks but that's not a problem just yet tbh. 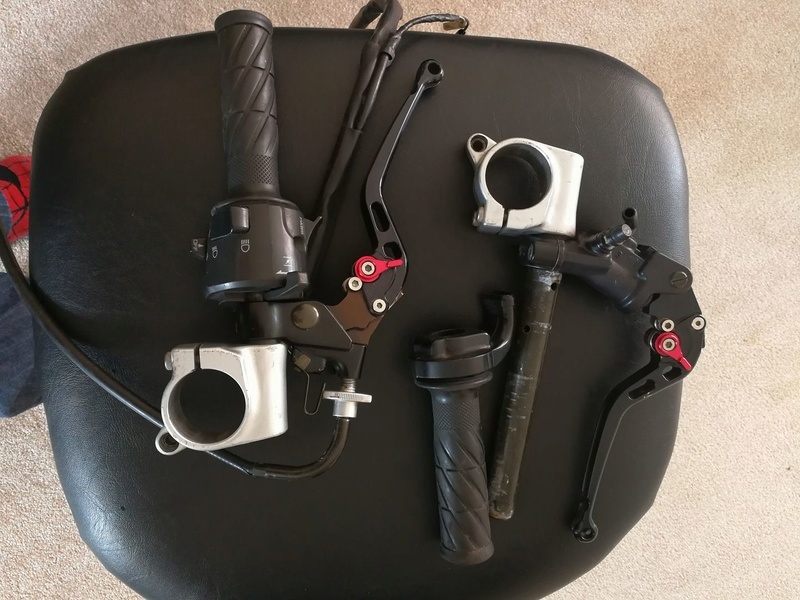 What do you still need as parts? Not 100% just yet, but I defiantly need front forks, radiator, rear sprocket and chain. I'll have a much better idea next week though when I start to place it all out and catalog it all. Chain and sprockets you want new, wouldn't go used on those, I have a set of ace forks but they are 50mm, I also have a radiator with fan I believe.